It's oh so easy to get lost in consumerism at this time of year. Tempting shop windows, special offers and never ending Christmas lists. The food, drink and nights out. It's all very indulgent! Which is why I think this time of year is more important than ever to take a little time and give something back to your community. Our local food bank is organised by the Church of England in Cramlington. St Nicholas Church in Cramlington village help 12 families per week and will help an additional 70 local families with food parcels over the Christmas period. I've included a shopping list with approved items for donation below, you can donate as many or few items as you wish. Reverend Steve is also keen to point out that special Christmas items such as nice biscuits/chocolates/Christmas cake ect.... are also very welcome at this time of year. You can donate at Cramlington Sainsburys (there is a collection box near the cafe entrance), at St Nicholas' Church during service times and I noticed a collection box at The Keel Row this week too. We are hoping to add a few of these items to our shopping basket every week and donate at Sainsburys. There are 3.7 million children living in poverty in the UK. This is a truly shocking statistic and makes me feel mega guilty about how lucky my children are. Their toy cupboard is bulging to the point where some of the gifts they received last year haven't even had the seal broken on them. It's embarrassing! Steve and Karen from Metro Radio have teamed up with B&M Bargains and Cash 4 Kids to help the 40,000 children in the North East who are living in poverty. All you need to do to help is donate a NEW and UNWRAPPED toy or gift suitable for children and young adults under the age of 18 to one of the registered drop off points before 15th December. There are drop off points in most towns and all gifts will be passed onto a child to make their Christmas morning extra special. We are donating the brand new toys that haven't been opened and are still sealed from last year. Almost 1 in 10 people say they have been homeless at some point and you can expect more than 2700 people to be sleeping rough on any given night in England. Crisis is a national charity for single homeless people who run Crisis Skylight Newcastle which aims to provide homeless and vulnerable people with a hot meal, warmth and comfort, fresh clothes, access to services and advice. The centre will help 300 people this Christmas. This year we will be donating gifts in kind to help the centre. They are particularly looking for non-perishable foods and drinks (eg tea, coffee, hot chocolate), toiletries, warm clothing and christmas decorations to decorate the centre. We are donating toiletries which we are adding to our basket when we are next at Home Bargains. Friends of the elderly are running a campaign this Christmas to raise awareness of the loneliness some elderly people can feel around Christmas time and have lots of simple ways we can help. 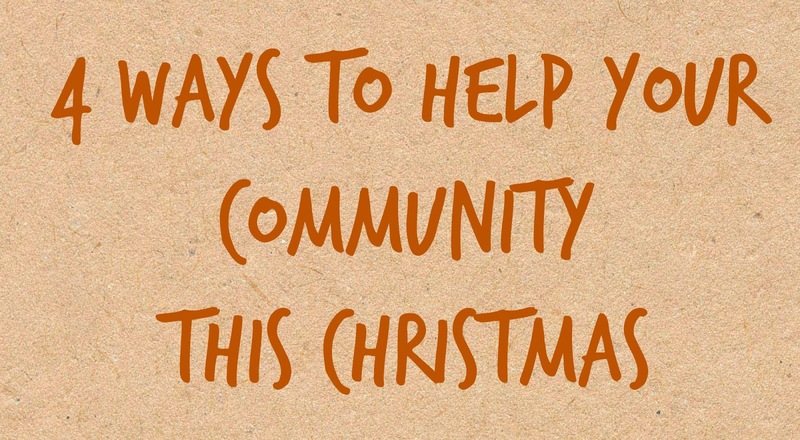 From writing an sending an extra Christmas card to inviting neighbours over for a mince pie and cup of tea, there are lots of ways to get involved. Read 10 ways to be a friend at Christmas and share your own ideas on social media using #beafriend. We are definitely going to make a conscious effort to wish more elderly people 'Merry Christmas' on the bus in the supermarket and will be writing extra Christmas cards for our elderly neighbours and relatives. We are going to ask our elderly neighbours if they fancy popping over for a mince pie and are sending extra Christmas cards from the children. 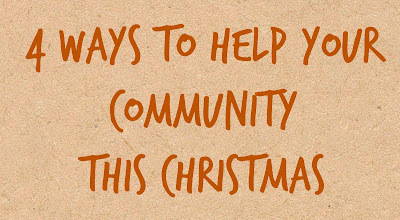 Helping your community at Christmas time doesn't have to cost you anything, there are lots of way you can join in and support your local community. Fab! Do you know about Making Winter Warmer? I'm thinking there's some collaboration there but not sure how yet. Probably need to chat to see how best to join the dots.